Today’s post will deal with something slightly different — but don’t fret: We will of course be talking about our favourite hobby, after all. In fact, I have prepared a small tutorial that some of you may find helpful. So what is this about? Now when I posted this on my various forum threads, two things happened. 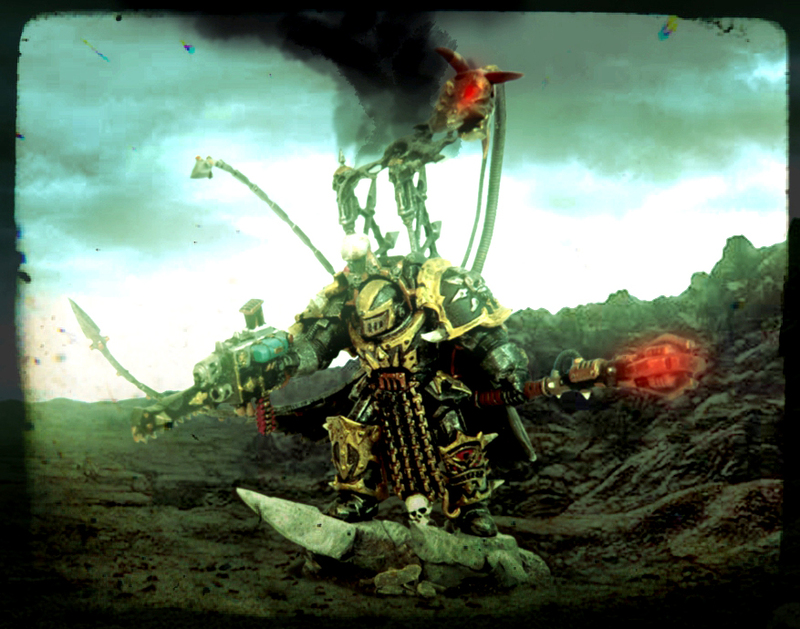 One, fellow hobbyist Kythnos asked me for a similar picture for his own Iron Warriors Warsmith and two, several people inquired about my recipe for creating images like this. 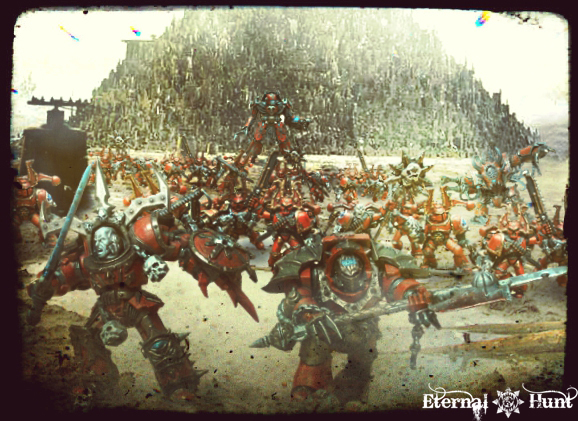 And I have actually been posting edited images involving my models for quite a while now, although I certainly don’t consider myself an expert when it comes to image editing — in fact, I am still very much finding my feet when it comes to various techniques. And I realised that, while I may not be an expert, I have managed to come up with a relatively reliable recipe for creating this kind of pictures — brilliantly dubbed “glamour shots” by Flint13 in a recent post. 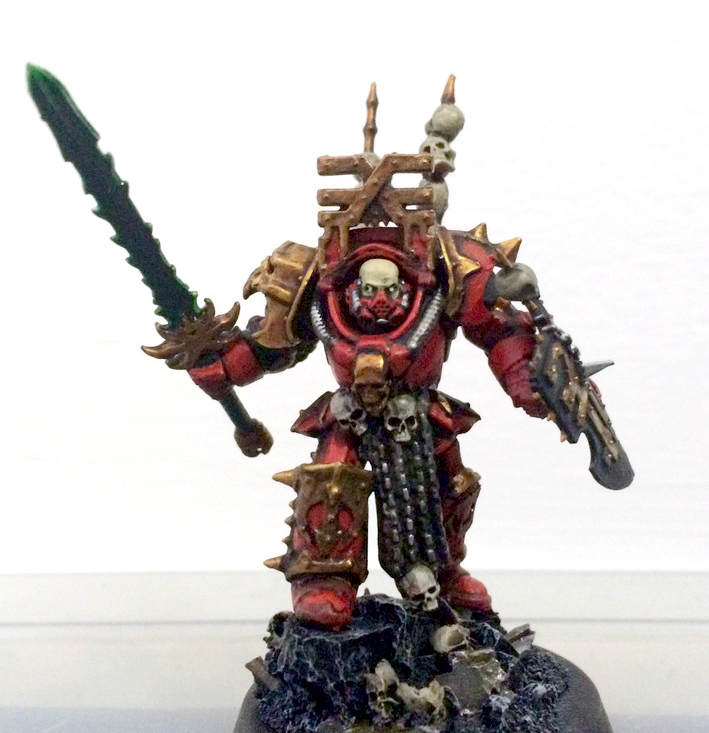 Now I realise that those pictures may be a somewhat divisive feature: When I first posted a couple of them, some of my readers seemed concerned that these would replace “normal” photos of miniatures on this blog. But these pictures aren’t a replacement for good, honest miniature photography, and certainly shouldn’t be treated as such. This is rather about exploring your models (and the characters they represent) from a different angle, about imagining how they would actually look on the battlefields of the 41st millennium. It’s about creating the dramatic, often hilariously overwrought, scenes we all know and love from the background. And, by extension, it can also become an additional way to start thinking about your models as characters rather than mere playing pieces, and I’ve always been a huge advocate of that! 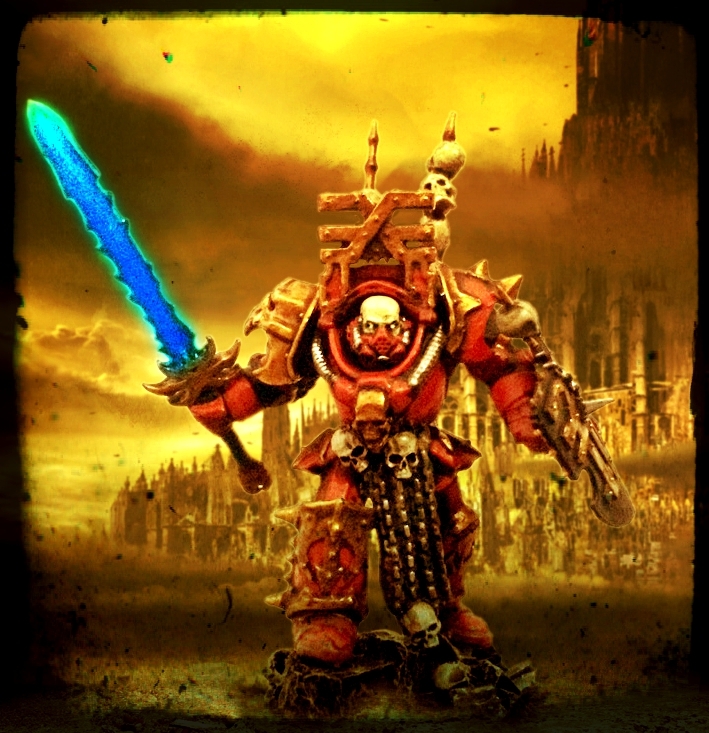 Anyway, to make a long story short, what follows is a small tutorial about creating suitably dramatic and garish “glamour shots” for your models. I’ll give you the short version (for now), although we may actually revisit parts of this in more detail at some point. This doesn’t represent THE foolproof way of creating images like this, but just one way that has worked reasonably well for me. I am 100% sure that there are far more elegant and/or accomplished ways for going about this, and people who are more knowledgeable about Photoshop will probably laugh about my fumbling efforts — fair enough, I say. I am absolutely not claiming to be a professional here, and this is therefore a very “quick and dirty” approach. I am also definitely not the first person to do a tutorial on this, but have rather been very lucky to find some excellent tutorials by other people to get me started: A brief but excellent writeup by Tyler Mengel showed me the ropes, and fellow German hobbyist Talarion introduced my to Pixlr, making my life much easier in the process. So thanks must go to them as well! When it comes to procuring suitable backdrops for your photos, there’s a big temptation to just steal everything you need from the internet — and to be honest, I have occasionally been guilty of the same crime. However, I try to go for pictures that are (or at least that I consider) fair game, i.e. stuff that is freely available and in the public domain. 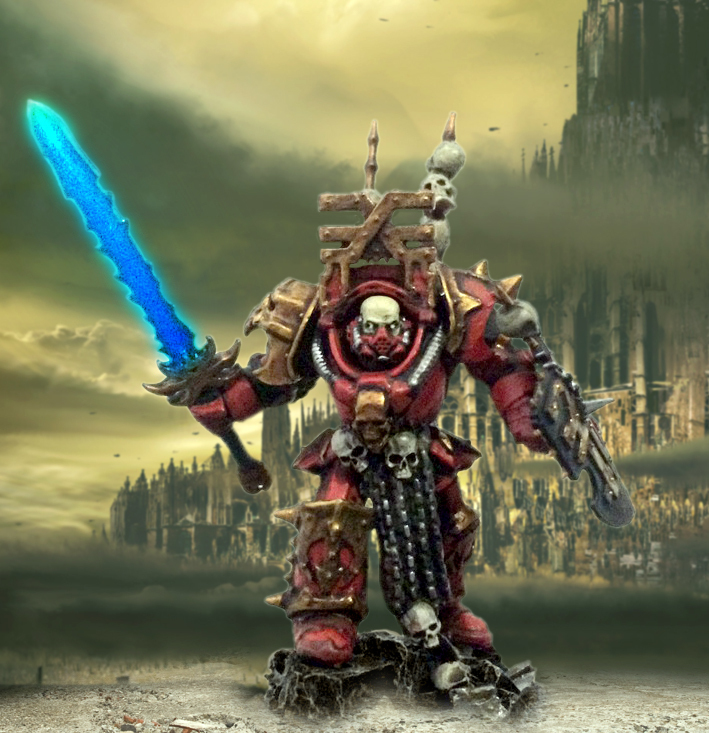 I will occasionally use material from GW or FW themselves, admittedly, but as I have no plan of using any of this commercially, I hope this constitutes fair use (bottom line, please don’t sue me, GW!). But please don’t just go stealing other people’s work left and right, alright? 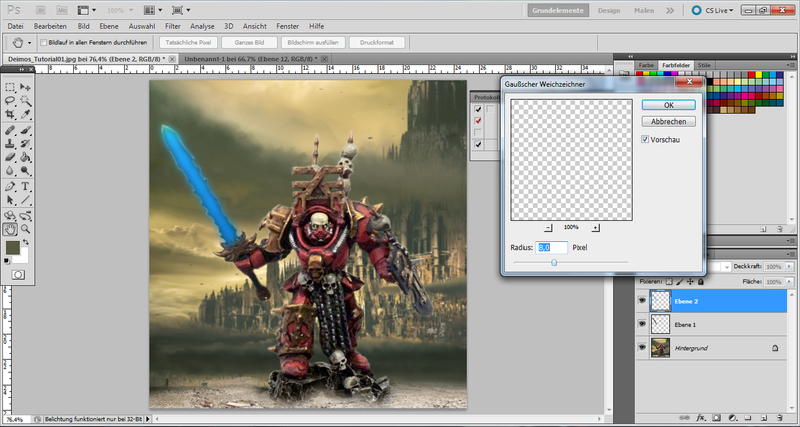 Finally, I will be using Adobe Photoshop for the first part of this tutorial. 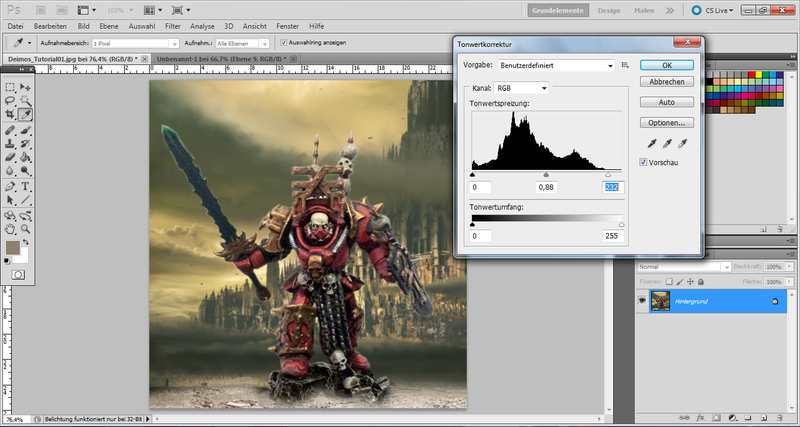 Similar software is freely available (GIMP would be one example, and there is also the web-based version of Pixlr). Most major functions are fairly similar across various programs, and I am not going into the differences and kinks of the software here. 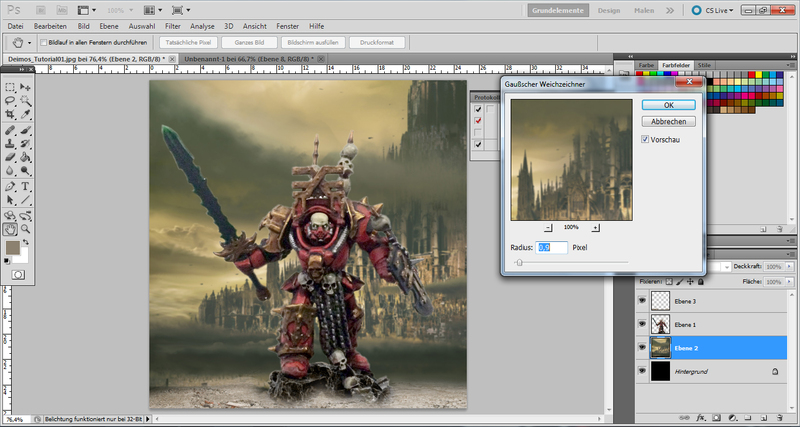 Neither will I be focusing on the details: Using this tutorial will require some (very) basic knowledge of image editing. a photo of your model(s) in suitable quality, taken against a neutral background (preferrably white, grey or beige). The photo needs to be sharp, in focus and bright enough. 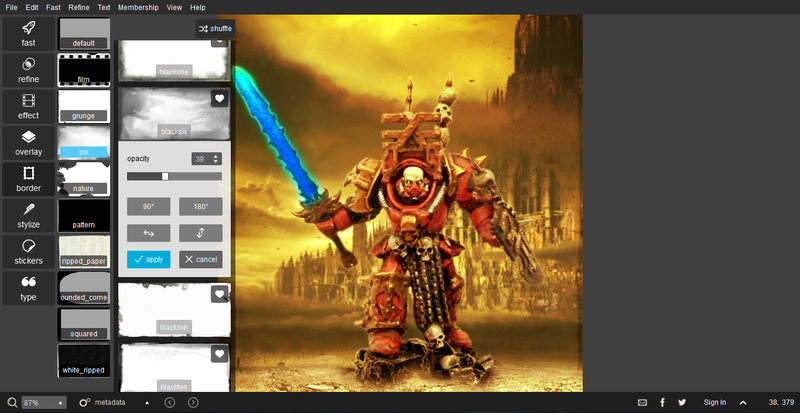 There are some excellent tutorials about how to take good pictures of your models here and here, for starters. some kind of image editing software, i.e. 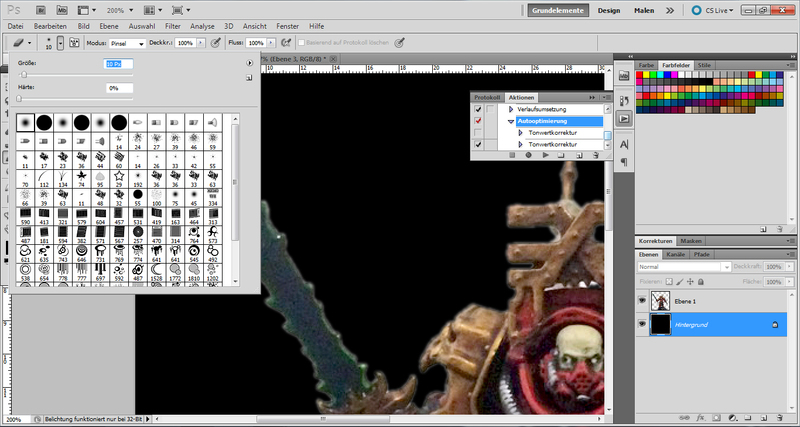 Adobe Photoshop, GIMP or Pixlr or whatever else works for you. I will be using the desktop version of Autodesk’s Pixlr for the second half of this tutorial, in order to add effects and certain colour hues. This isn’t a necessary step, but Pixlr will make things much easier here, especially if you have little knowledge about Photoshop, and the software is free, so I recommend you download it. The picture is a bit more grainy than it should be, but it’ll do. 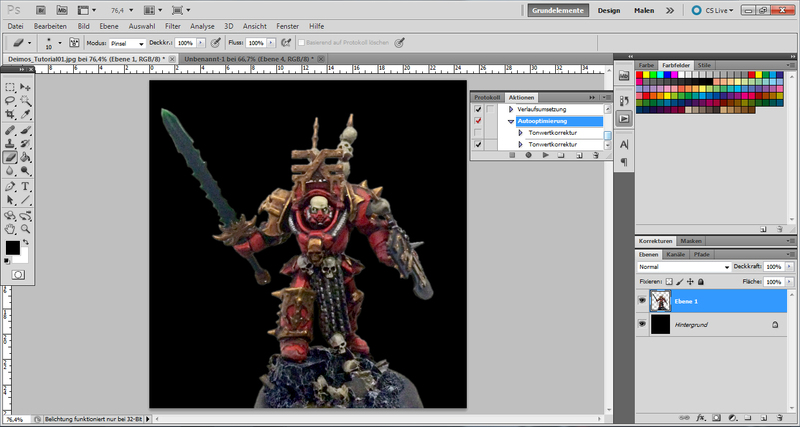 It’s against a white background, which is great, because it will make cutting out the model far easier. If you want, you can play around with brightness, contrast and the levels a bit at this stage, in order to make the photo a bit more crisp and rich in contrast. The first thing you want to do is to duplicate the layer on which your image is, so that you have the background layer (the original image) and another layer above it (also your original image, but that will change shortly). Select this new layer. Don’t forget any white areas! 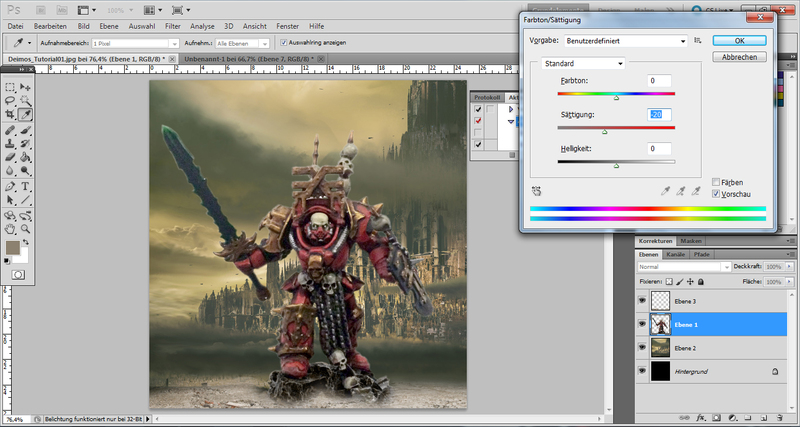 There is also a way of having Photoshop auto-select every bit of white on the canvas, but that would mean all the white that’s part of the actual model as well, and we don’t want that. So make sure to select all the bits of white background, until it looks like the picture above. Then invert your selection (this function can normally has its own tab, or it can be found under “Edit”. 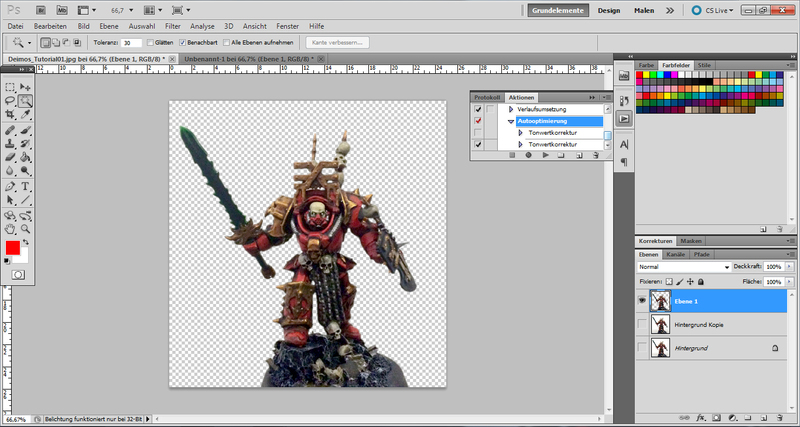 Once you have done this, the border will be running around your model rather than around the entire canvas. Not bad, eh? But some remnants of the orignal background and some reflections remain. In the above picture, it’s very obvious on the arm holding the sword. …then set it to a size you are comfortable with and carefully work away at those edges that look like they are glowing. Be careful not to take away too much and rather work in multiple increments! If you make a mistake, you can always undo your last couple of steps! I also cleaned away the parts of the base that didn’t work — especially the black rim. In this case, I wanted the model to look a bit more desaturated. Just play around with this — if you don’t like the outcome, you can always undo your actions. Once you’re happy with the background, give the layer with the model the same treatment — although with much less blur applied. This should only make the entire picture seem a bit more realistic. 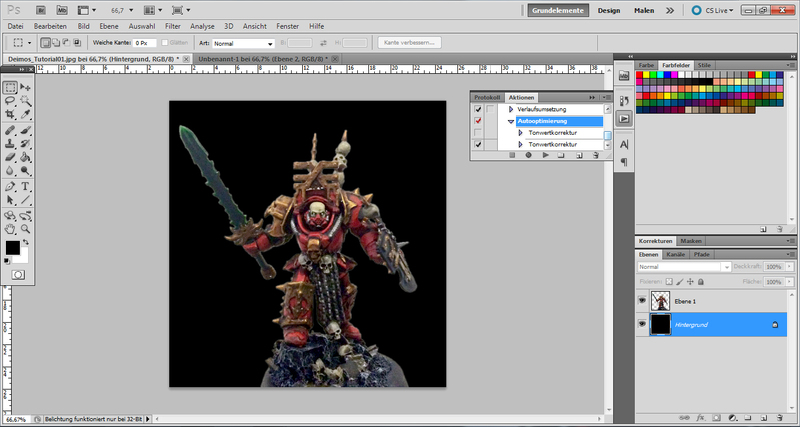 Make sure not to obscure any important detail on the model during this step! Not bad, not bad at all! We could even call it finished at this point! 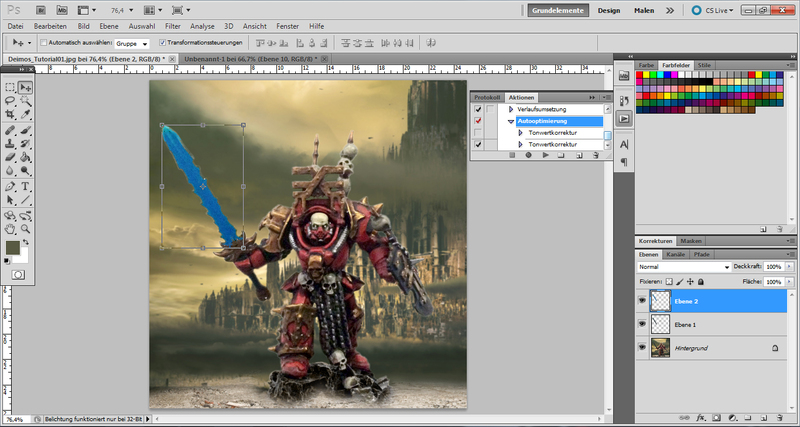 Now while it would be possible to do everything else in Photoshop as well, you can make your life a bit easier by switching to Pixlr for the next steps. Pixlr is a bit of a one-trick pony in that it has been designed to add various effects and colour hues to photos — and precious little else. While this would also be possible in Photoshop, Pixlr makes it really easy for you because it does most of the thinking for you. So let’s open up our picture in Pixlr. It goes without saying that you don’t even have to photoshop in a suitable background in the first place! 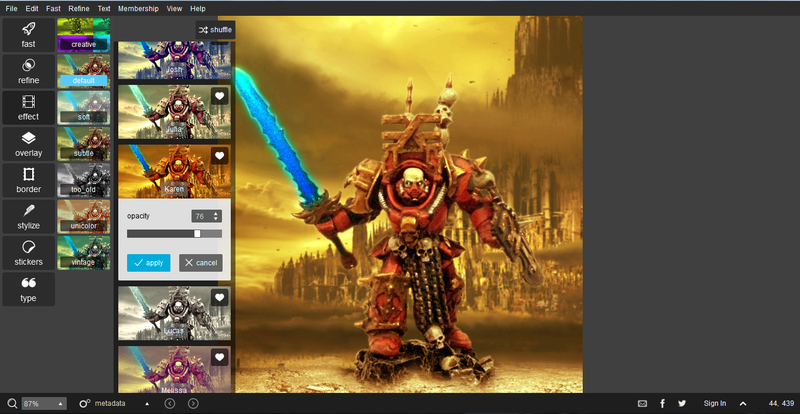 If you have some 40k/tabletop terrain at home, you can just take photos of your models in front of it and work from there — if anything, this should make your life easier! On the other hand, you don’t even need to create elaborate montages like that, either: Just use some of your existing photos and go play around with them a bit for starters! Some of my first experiments in this vein can be found here. Whatever you do, remember that you are not trying to pass of your models as something they are not — you are just exploring another facet of the hobby. So give it your all and don’t forget to have fun along the way! Thanks to Biohazard for – unwittingly – providing the material for this: Cheers, buddy! 😉 And, as always, thanks for looking and stay tuned for more! 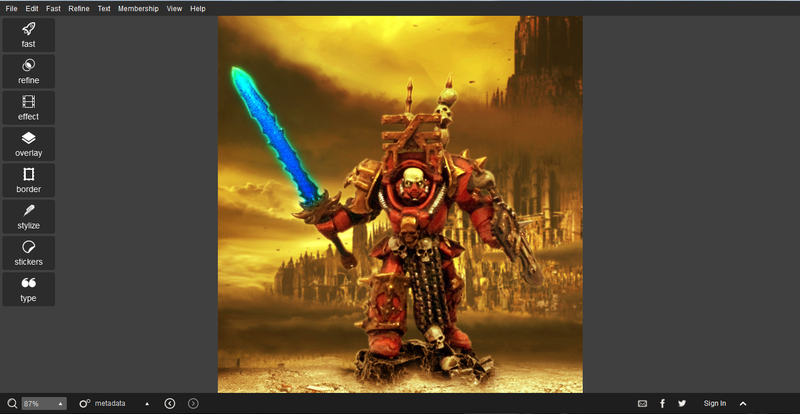 This entry was posted on April 15, 2015 at 09:00 and is filed under 40k, Pointless ramblings with tags 40k, image editing, photo montage, photography, photoshop, pixlr, tutorial. You can follow any responses to this entry through the RSS 2.0 feed. You can leave a response, or trackback from your own site. I am now downloading Pixlr! Have fun! It’s a great little piece of software to just mess around with. Excellent Tutorial mate! Been wondering how you did those! Like I said, there’s really no right way or wrong way: Both are viable approaches when it comes to exploring both your army and the 40k universe. Excellent tutorial. Clear, easy to follow and excellent results. Really cool to see these characters in this new, more realistic way. I am normally not a big fan of the 40k aesthetic, but in their natural habitat 😉 they really look good. You’re such a hipster mate 🙂 I like this concept, sure standard white/black backdrops are better when studying a nice conversion/paintjob. 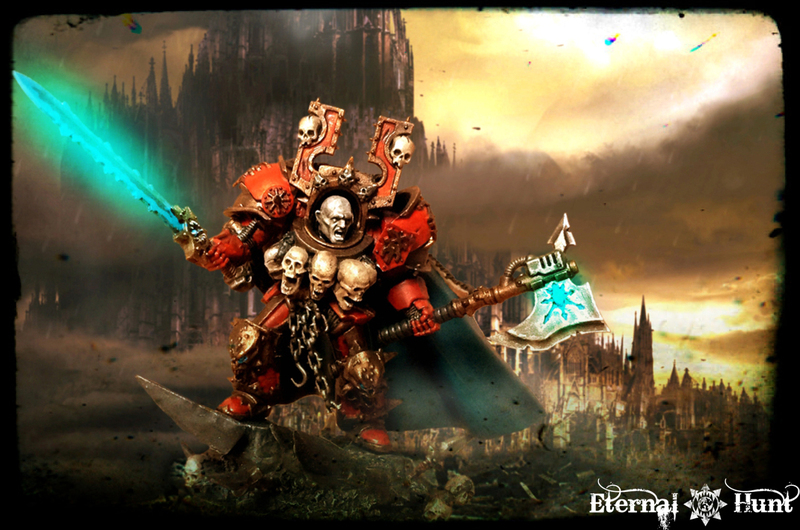 But this sets the mood, for inq28 I can see a lot of cool rpg possibilities. I could see those as charater sheet illustrations. 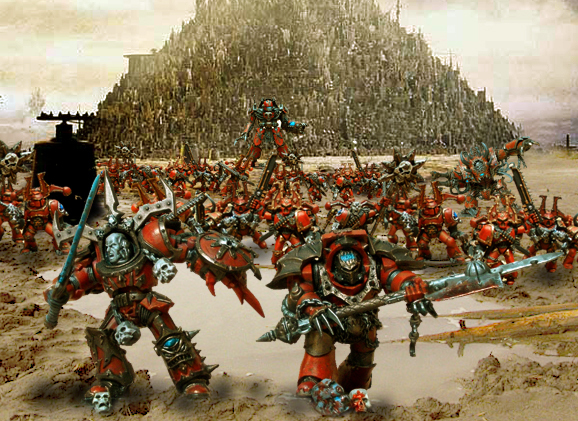 Is there not a 40k RPG? Would suit it perfectly and woudl also be much more appropriate then the usual white background shot. Yeah, my thinking exactly! 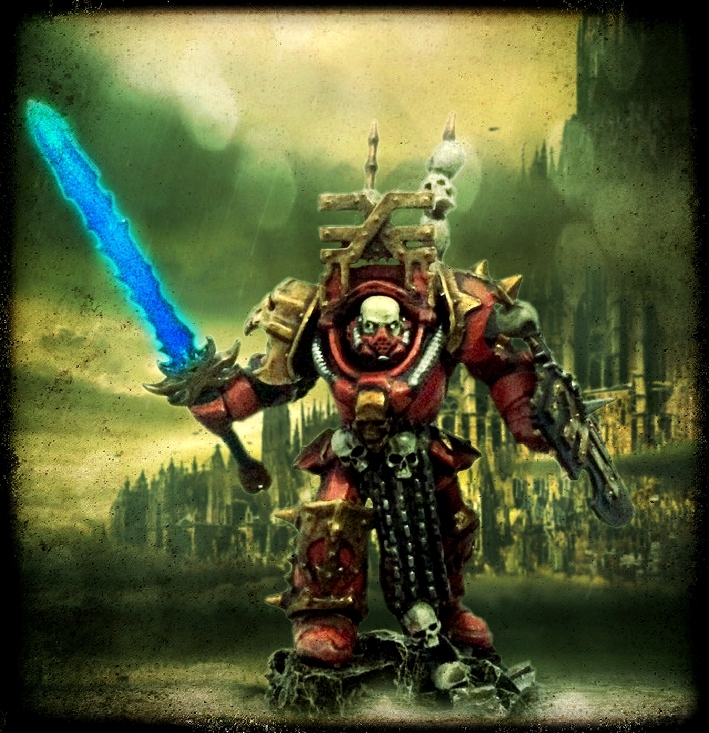 If somebody were to make a character sheet, source book or even a mini-codex for their own army, glitzing up the pictures a bit would make a lot of sense, wouldn’t it?